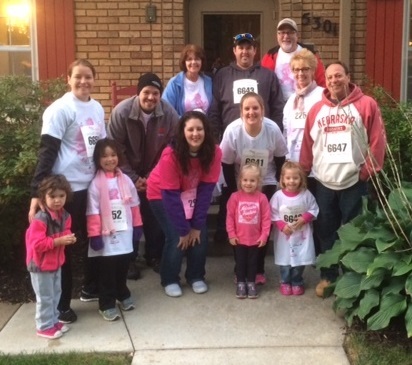 April Leedom (front row, pink shirt) with the Racy Racers team. “My doctor has a quote in her office that reads, ‘It’s your life’, and I believe that,” says April, a 40-year-old from Fremont, Nebraska living with stage 4 breast cancer. Like any busy mom, April is constantly on the move with her six-year-old daughter, working, taking care of the house, and trying to get some free time to go camping with her daughter and husband, Russ. In 2012, she was diagnosed with breast cancer when her daughter was 16 months old. Three years later, the cancer had metastasized to her chest well. April calls out the fact that “people expect me to look sick and that’s not the case at all.” She imagines some people are surprised that she continues to work through her treatments. Despite having treatment every three weeks that zaps her energy, April believes that investments in ongoing research allow her to live her life as fully as possible. Your support of the Race for the Cure® gives April treatment options that allow her to enjoy life. Join April and the Racy Racer’s team on Sunday, Oct. 8 at the 24th annual Race for the Cure in Omaha, Nebraska to raise funds for local programs and critical breast cancer research. ⇐ Endless miles. Pink tennis shoes. A man on a mission.